Basic physics techniques including radar and thermal imaging are vital for the newly emerging field of aeroechology - the science of things that spend much of their lives aloft. There are ecologists who study land, and ecologists who study the ocean -- but who looks up and studies the air that circles the entire planet? Until recently, not many. Formally established just three years ago, aeroecology is the study of flying and floating organisms in the air they inhabit. Biologist Thomas Kunz from Boston University is pioneering this new field. He notes that that the air is the only environment that moves freely, and quickly, around the entire planet. "Aquatic environments are interrupted by land, and terrestrial environments are interrupted by water," said Kunz. Kunz cautions that the air is an environment, not an ecosystem. Except for a few bacteria that might spend their lives in clouds, the airborne creatures require the energy from photosynthesis that occurs on land or in water. For the first time last week, the Ecological Society of America included a session on this buoyant new discipline at its annual meeting. Radars played a key role in launching the field of aeroecology. Meteorologists have long recognized that creatures flying through the radio waves scatter the signal. So, they routinely filtered out that noise to get a clearer picture of the weather. But according to biologist Winifred Frick of the University of California, Santa Cruz, that discarded "biogunk" is just the information scientists need to observe flying animals at the scales that matter most. Radar signals, with centimeter-long wavelengths, are the right size to reflect off creatures the size of birds, bats, and even moths. The maximum range of a radar is 288 miles, an area large enough to potentially track a foraging bat. In the United States, a network of 159 next generation weather radars known as NEXRAD has been scanning the air every 5 minutes for the last 20 years. Meteorologist Phillip Chilson from the University of Oklahoma has been instrumental in recovering the biological backscatter from NEXRAD archives. "This could be one of the largest biological repositories in existence," said Chilson. When scientists piece together a time series of NEXRAD backscatter images, they see patterns in the air on a spatial and temporal scale never before possible. Armed with the ability to visualize flying creatures, researchers are starting to look for larger ecological patterns in the air. During the Ecological Society meeting, Frick played a movie of backscatter images in which a weather front corralled insects along its leading edge. Bats, which have a higher reflectivity and are represented by warmer colors in the images, suddenly emerge from their cave, zero in on the insect buffet, and attack along its length. Frick analyzed the timing of bats emergence from caves and related it to climate. In a drought year bats emerge earlier in the evening than in a wet year. She suggests populations of insects increase in wet years so foraging requires less time. Entomologist Jason Chapman used radar and wind data to show that silver Y moths, thought to be passive passengers in wind currents, actively select favorable conditions for migration. In the springtime they wait for winds that push them northward. In the fall, they choose winds that carry them back to the south. Just how such clever decision-making by an insect is achieved, is unknown. Aeroecologists presented an array of technologies unraveling connections between fliers and their airspace at the meeting. 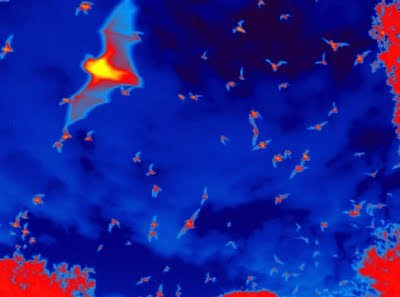 Thermal imaging lets scientists track bats in the nighttime skies, a previously unfeasible task. Biologists from Israel use small GPS sensors to track the movements of Egyptian fruit bats. Bats wearing radio trackers teach researchers more about patterns of flight. Genetic analysis of feathers helps identify the breeding and wintering grounds of songbirds. Complex mathematical models predict the movement of seeds across heterogeneous terrain. Despite advances, questions fundamental to aeroecology remain. "We'd like to know the biomass of what's in the air," said Kunz. Considering the scientific and technological effort now aimed upward, Kunz added, "I think we'll ultimately get there." Coming next week...The Physics of Cars! The Solar System in Northwest D.C.